The MopTop LOC Method calls for our Leave-In Conditioner, Mongongo Oil, and Curly Hair Custard. If your hair performs well using creams and oils, then you will want to use more Leave-In Conditioner and Mongongo Oil, and LESS Curly Hair Custard. If you are too heavy-handed with the Curly Hair Custard, it can dry flaky. A quick fix would be a spritz or water or oil to add moisture and eliminate flakes, and then use less Custard going forward. For the Curly Hair Custard, apply root to end, making sure all sections and strands are covered. Scrunch your hair and DO NOT touch until 80% dry, whether diffused or air dried (curls are friends and they LIKE to be together while they “Set”), then scrunch and go. Texture: The more curly or tighter the texture, the wetter your hair should be when applying a styler (so wavy hair can be damp) AND wavy, curly and tighter coiled hair will use more product. Length: The longer the hair, the more product you will use. Color: If too much product is applied to darker hair, flaking will be easier to see. Use a spray water bottle to dilute, and next time don’t use as much! Porosity: A lower porosity hair will use less of our gel -based products, and more of our cream-based products and oil. Remember: A little goes a long way, even with a lot of hair, so try applying with a light-hand until you understand how the products will work in your hair! If you have questions, we are only an email away. 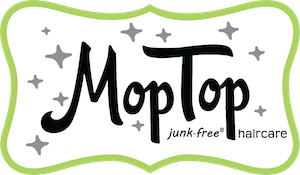 Differences between our Salon-Grade and our Natural, Junk-Free product lines.